Although America long ago had a Virginia architect as president—Thomas Jefferson—never until this year had someone reached its highest office from the considerably less elevated realms of New York real-estate development, Atlantic City casinos, and TV reality shows. Grotesque though the rise of Donald Trump has seemed to many, his political ascendance has struck those of us who love architecture as a particularly personal affront, given our familiarity with his forty-year record as the foremost architectural schlockmeister and urban design vulgarian of his generation. Trump’s insistence, wholly at odds with the built and economic evidence, that he saved the faltering New York City of the 1970s through his characteristically glitzy but inevitably cheesy projects was but one in a series of big lies that culminated in his pronouncement, at the Republican National Convention this past summer, that he alone could solve America’s problems. 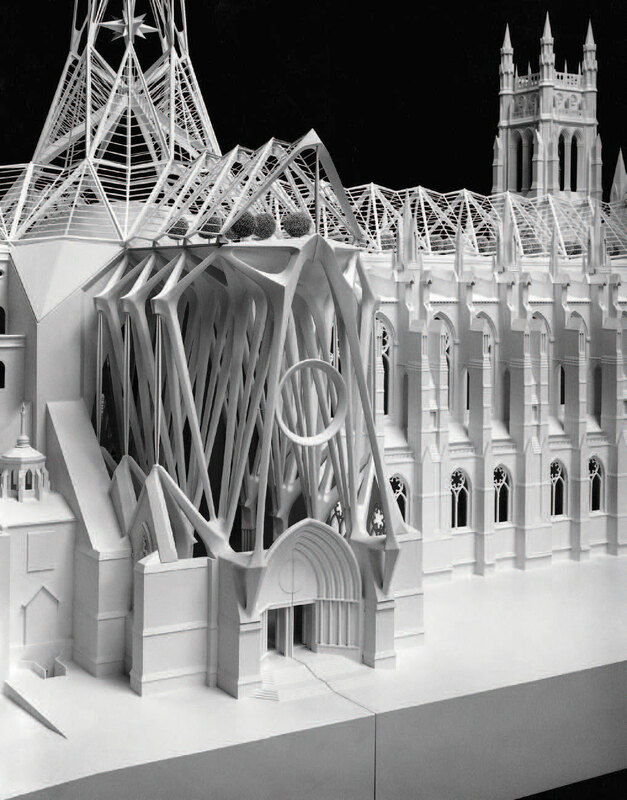 Though Never Built New York contains some well-known proposals that never made it past the design stage—among them Frank Lloyd Wright’s St. Mark’s-in-the-Bouwerie Residence Towers (1927) and R. Buckminster Fuller and Shoji Sadao’s Dome Over Manhattan (1960)—much else will be revelatory even to specialists. For example, I’d never known about Cass Gilbert’s 1931 attempt to conceal the steel latticework towers of Othmar Ammann’s George Washington Bridge beneath a stripped classical slipcover of pink granite. Likewise I’d been unaware of Philip Johnson’s monster quartet of Brutalist apartment slabs for Chelsea (1967), not far from where the High Line has lately become a magnet for high-style condo architecture. Architectural competitions provide a mother-lode of material for such roundups, and Never Built New York also includes hilarious duds such as an entry in the 1858 contest to design Central Park submitted by one John Rink resembling a green Suzani embroidery from Central Asia. 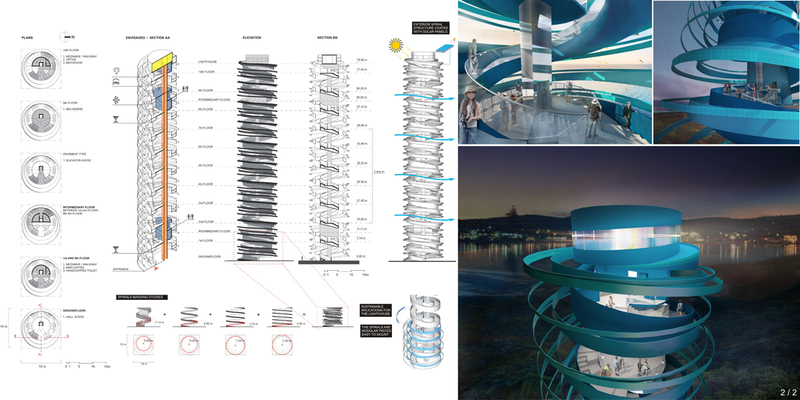 Considering this dreadful alternative, it is not surprising that Frederick Law Olmsted and Calvert Vaux’s sinuously flowing and veritably breathing proposal jumped out at the jurors and won their approval. Tellingly, the outsized scale of Manhattan’s manmade environment—its legendary skyscrapers, unrelenting right-angled street plan, and dramatic landscape centerpiece—dwarfs even the most grandiose visions for single buildings. 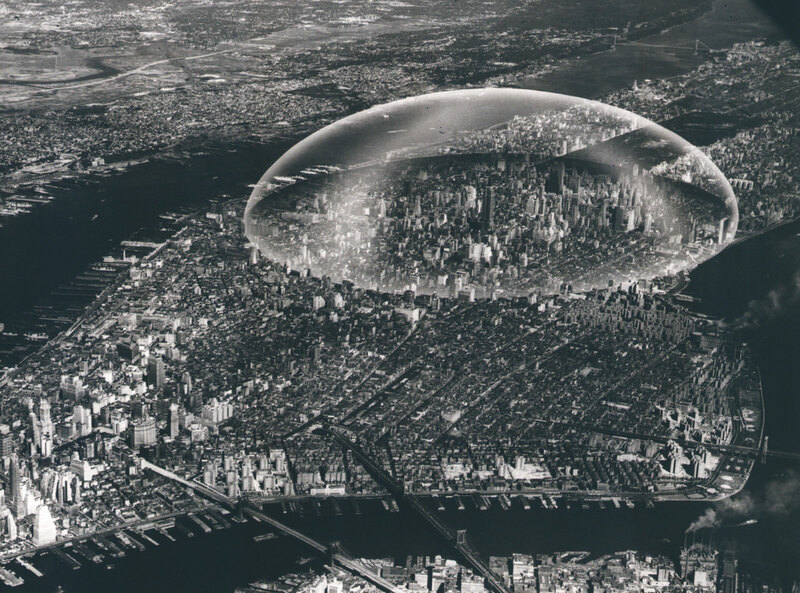 Thus, the individual structures in Never Built New York tend to be overshadowed by the vast infrastructure needed to service a tightly contained metropolis of millions. 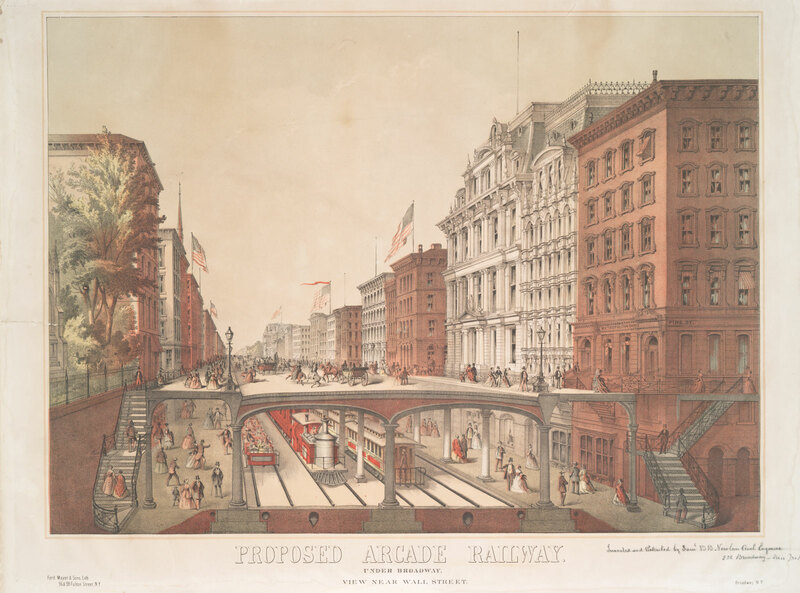 Several projects in the book address the extreme transportation congestion that already plagued Manhattan by the mid-nineteenth century and prompted solutions like Egbert Ludovicus Viele’s Arcade Under-Ground Railway of 1866, a fictive forerunner of the subway system. 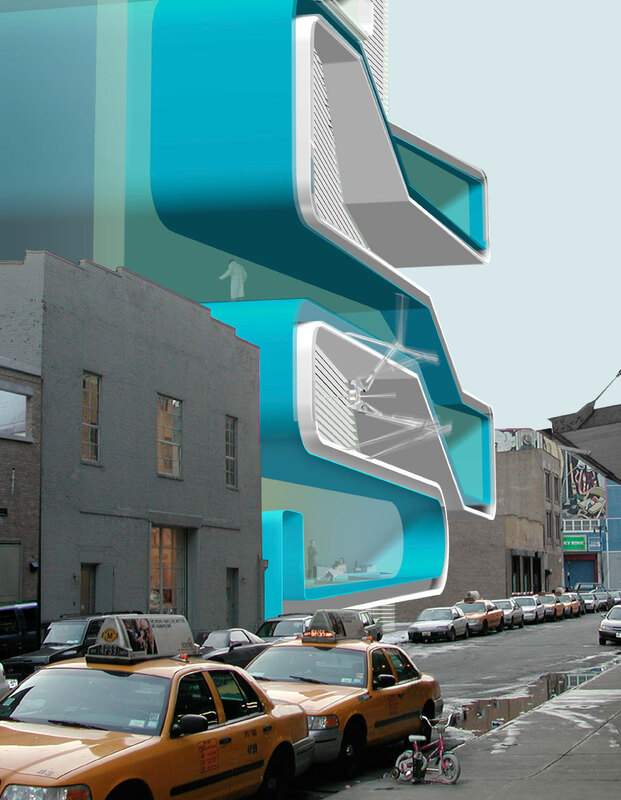 This pipedream eschewed deep digging, since steam trains would need to run above ground, while vehicular and pedestrian traffic were to be hoisted up to an elevated roadway fifteen feet above existing sidewalks. (The initiative was killed by a gubernatorial veto after objections from ground-floor merchants along the right-of-way.) And then there are the manias to improve street traffic that have sporadically gripped urban planners, especially Beaux-Arts-era campaigns for diagonal, grid-slicing thoroughfares in imitation of Baron Haussmann’s radial Parisian boulevards. What sets Never Built New York apart from its predecessors are the numerous schemes depicted through computer-generated imagery, which can now attain such verisimilitude that it’s hard to tell if you’re looking at a completed project or a mere predictive apparition. This blurring of reality can be of immense commercial benefit (no need to tell that to Trump), and it is widely assumed that the more lifelike an illustration, the more a client will believe that what it shows can be realized. However, Never Built New York repeatedly demonstrates that the psychological charge conveyed by a powerful drawing outstrips even the most realistic digital simulacrum. 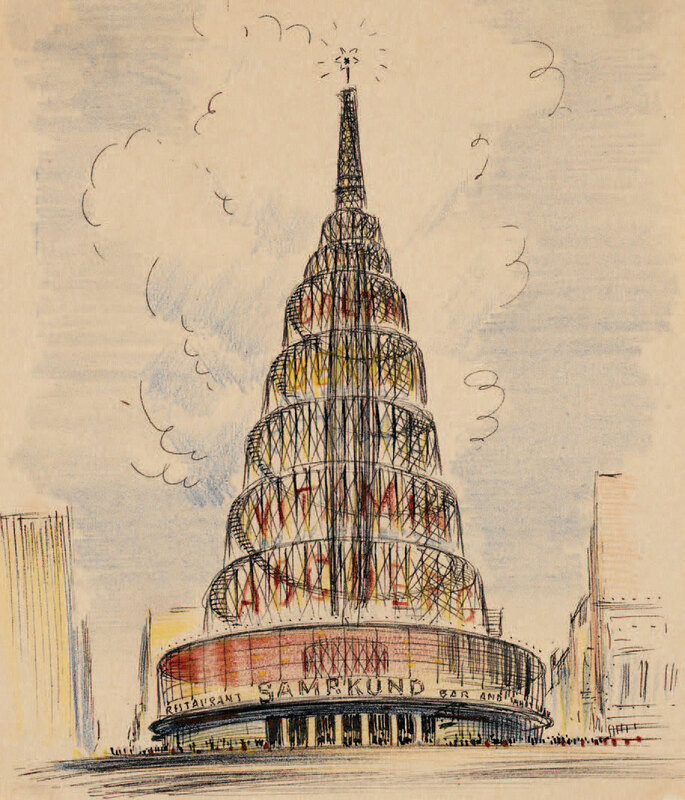 The celebrated architectural draftsman Hugh Ferriss, who flourished in the Twenties and Thirties, is represented by his charcoal sketches of boldly imaginative cityscapes, which seem plausible because of their appeal to the period’s deep belief in progress as the basis for modern civilization. Similarly, its hard to resist the arrestingly colored renderings of Ely Jacques Kahn, the hugely successful New York-born Beaux-Arts-trained architect whose lively Art Deco commercial buildings continue to adorn the city. Kahn’s drawings, on yellow tracing paper, of his proposed Dowling Theater of 1945 on Times Square convey the same mood of postwar confidence and nocturnal glamour evoked in Martin Scorsese’s cinematic love letter to that time and place, New York, New York (1977). If the character of every great cosmopolis depends to a large extent on conspiratorial belief in a shared myth, then these compelling dream images of a bygone Gotham still work their magic today. 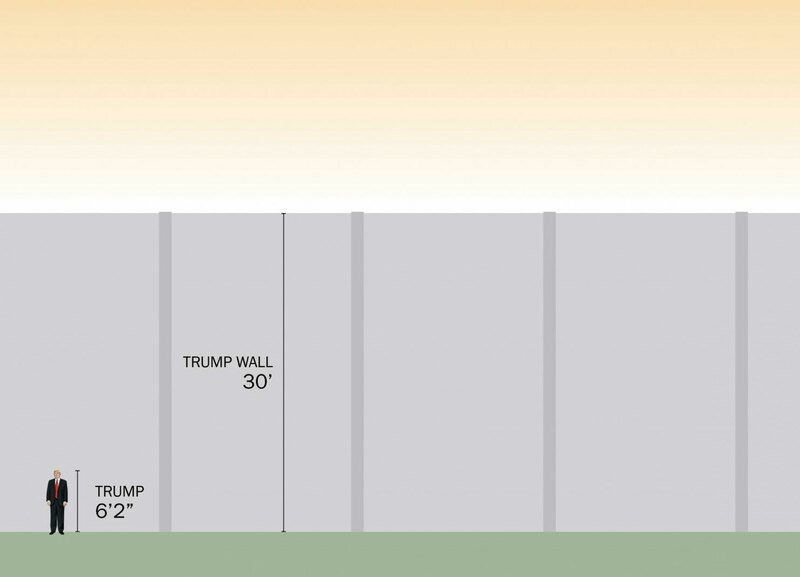 One of course cannot help but wonder what Trump will impose architecturally on our national landscape, especially since he has promised to create vast infrastructure projects, most notoriously his “big, beautiful, powerful wall” along the 1,989-mile expanse of our border with Mexico. Though he has vowed to make Mexico pay for that barrier, he is far more vague about how his other mega-construction schemes would be financed. Trump has announced that he will put his business operations into a “blind trust” controlled by his three oldest children, but how truly disinterested can a famously controlling parent and his financially enmeshed offspring be under such circumstances? This cozy familial set-up raises the specter of wholesale conflict-of-interest—“Nobody builds walls better than me, believe me,” he has assured us—to say nothing of outright corruption if he oversees such a massive undertaking. Time and again I have written that one of the surest reflections of a society’s values can be found in what it builds. Despite uncertainties about exactly what travails the Trump presidency will bring us, I am convinced that the architectural imprint he has already imposed—extrapolated to a national scale—tells us all we need to know. Never Built New York is published by Metropolis Books and distributed by Artbook DAP. In an exclusive interview during a recent trip to London, Zumthor explained his vision for the project. The project will see four of LACMA’s deteriorating structures replaced by the new Zumthor-designed building, which will house the museum’s permanent collection of historic and contemporary art. Eight semi-transparent pavilions will support an elevated, organically-shaped main exhibition level, with access points to the surrounding gardens. “The museum is open to the outside; this is very important,” Zumthor told CLAD. “You’ll have this almost sacred, sublime kind of experience, but I would also like to accommodate the profane, the dirty, the normal, the everyday. Zumthor highlighted the Palazzo Fortuny art museum in Venice as an example of the qualities he is aiming for with his design, which he summarised as “a rich atmosphere, historic density and material presence”. 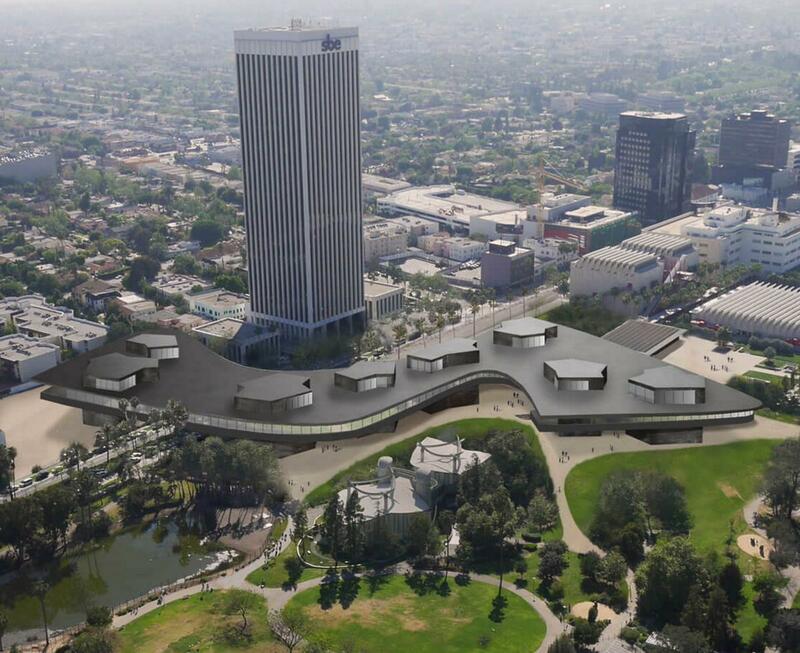 The architect also revealed that he is working on new images of LACMA to illustrate his proposed design, adding that the “commercial-looking” visualisations released in August were created for an environmental review only. Speaking about his architectural philosophy, Zumthor argued he aims to provoke emotions with his designs. He said: “I love buildings. When I look back on my life I love the buildings that speak to me by means of their atmospheric qualities, a feeling of history, of being complete. I want to make buildings which have the capacity to be loved, that’s all. An extensive interview with Peter Zumthor will be featured in the next issue of CLADmag. Meanwhile his long-running work on Norway’s National Tourist Route is featured a in the new issue of the magazine, which can now downloaded as a PDF or read on digital turning pages. Projeto da HDAA recebe menção honrosa internacional. A HDAA – Heitor Derbli Arquitetos Associados, recebeu Menção Honrosa na MNPG Arch Competition pela criação do projeto abaixo. Um farol que representa a simbologia de uma navegação. Os barcos, seus trajetos pelo mar, seu retorno. 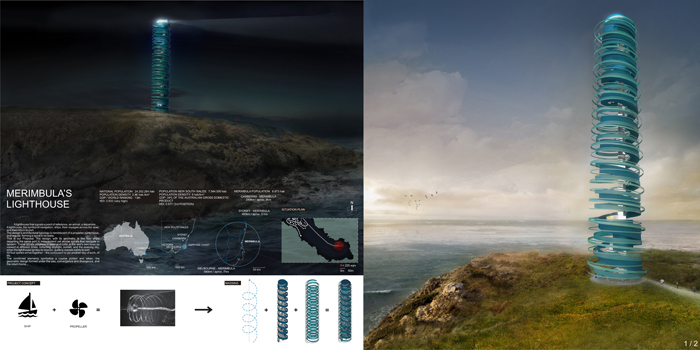 A tipologia projetual remeteu ao movimento de hélices, contínuo, regular, desenhando um espiral sob o mar. Esta é a nossa Proposta. O desenho, sua geometria, como se fossem quatro barcos partindo do mesmo ponto, com movimentos helicoidais independentes, mas próximos, parecidos, como se navegassem juntos. Esses helicoides em aço e cor, em tons do mar, em suas variadas horas, refletindo a luz do dia, o entardecer, o anoitecer; quando o farol passa a iluminar, a direcionar os barcos para sua chegada. Os mesmos quatro helicoides chegam juntos, em mais um dia de trabalho, de vida. Documentário muito interessante sobre o Jean Nouvel, com entrevistas. The biggest temptation is to jump right in. There are solutions that come to you. There are images that spontaneously appear. My method is rather to hold back as long as possible, to really imagine it spatially, so to be sure I have something to say. Award winning documentarian and critic Matt Tyrnauer (director of Valentino: The Last Emperor, Citizen Jane: Battle For The City) has released a new documentary taking a look into the mind of world-renowned architect Jean Nouvel and his design process. The film, titled Jean Nouvel: Reflections, follows the French architect around the world to visit his most recent works, including the Philharmonie de Paris, Institut du Monde Arabe, Fondation Cartier, Musée du Quai Branly, and Doha Tower and future projects, notably the National Museum of Qatar, his New York skyscraper, 53W53, and the Louvre Abu Dhabi. The footage captures Nouvel working through problems at all scales and in all stages of his process: from conceptualizing, to sketching, to deciding the hue of the stones to be used in the galleries of the forthcoming Louvre Abu Dhabi, as he explains the inspiration behind his landmark works. Jean Nouvel: Reflections recently premiered at the 2016 New York Film Festival, and is also an official selection at Milano Design Film Festival, Savannah Film Festival and the Chicago Film Festival. More information about the documentary can be found here. 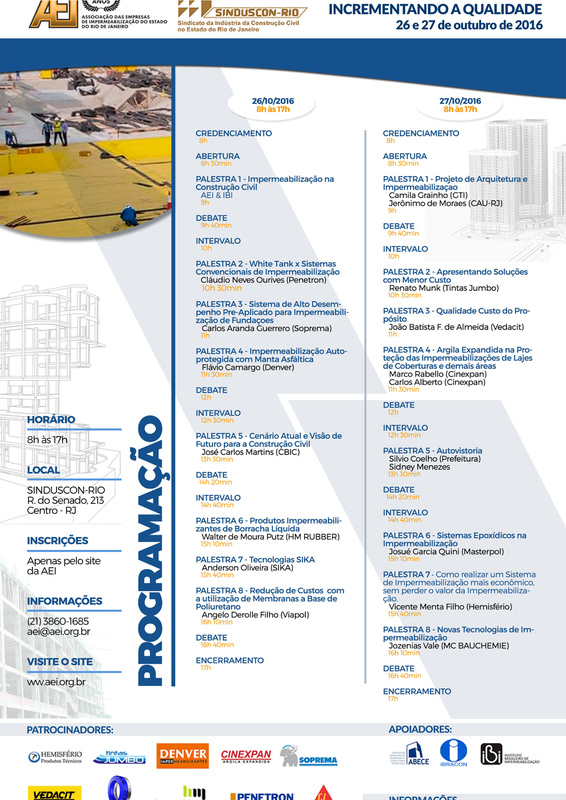 Cadastre seu nome e email para receber nossa newsletter de informações sobre as atividades e eventos da ASBEA/RJ abertos ao público.